* Commanders for Israel Security: Some of Israel’s Top Fighters Now Push for Peace; via Bloomberg: Some of Israel’s Top Fighters Now Push for Peace. The two-state solution isn’t dead. It has some influential people on its side. It is true that Israel’s right, which is traditionally less inclined to make concessions to the Palestinians for a peace deal, feels little pushback from once powerful but now anemic peace-seeking political left. Politicians like Naftali Bennett, the leader of the religious Jewish Home party who serves as education minister, continuously advocate that Israel annex significant portions of the West Bank, in large measure because he thinks that Prime Minister Benjamin Netanyahu is vulnerable from the right in the next elections. Yet to portray Israel as being in the grip solely of the right is to ignore signs that more moderate voices may be galvanizing. A year ago, Israelis driving along the major highway that cuts through Tel Aviv were startled to see enormous signs in Arabic covering buildings. It felt, for a moment, as if one were driving in Ramallah and not in Tel Aviv. That was the point. The gigantic posters in the colors of the Palestinian flag said, “Soon we shall be the majority.” They were the work of a large group of Israeli former security officials, embarking on a campaign to warn that annexation of the Palestinian territories, as proposed by Bennett and others, spelled demographic doom for Israel. Do that, they insisted, and you will, indeed, soon be seeing Arabic and not Hebrew on the way to and from work. The group, Commanders for Israel’s Security, is largely the brainchild of Amnon Reshef, who retired from the Israel Defense Forces as a major general and is regarded as one of the heroes of the Yom Kippur War. CIS has gathered the support of more than 270 seasoned officers from the army, the Mossad, the Israel Security Agency (Shin Bet) and the police, all of them from the rank of brigadier general and above. According to Reshef, that represents 80 percent of those eligible; those still in the employ of the government or the army are precluded, by law, from joining. Palestinian statehood is not the real question currently before decision-makers. Rather, the question is whether Israel aspires to leave open the possibility of future negotiations towards a two-state solution, or it will act towards closing this option by expanding isolated settlements and entering an unstoppable process towards a bi-national state situation. … Israel must not jeopardize its existence by embarking on rash unilateral initiatives that would radically worsen its security situation – just to please proponents of ‘forward progress’ at any cost. This risk is not worth taking. CIS’s proposal is straightforward. Israel should preserve conditions for a two-state agreement and take steps to start separating from the Palestinians, even if a peace partner does not exist at this moment. The IDF should maintain absolute security responsibility for the West Bank, but make clear that the military’s presence beyond the security barrier is temporary, a “security deposit” pending an eventual two-state agreement. In the meantime, Israel should take economic and military steps to improve conditions and diminish conflictual interactions between Israelis and Palestinians. Israel should state explicitly that its goal is two states for two peoples, and should do nothing that would preclude that arrangement. CIS’s most visible supporter is former Prime Minister Ehud Barak, who had also been IDF chief of staff. Barak recently made no secret of his exploring a return to politics; many suspect he’s aiming to become minister of defense under another prime minister. He is trusted by Israelis on security matters, and has publicly endorsed CIS. In addition to improving Israel’s security, he argues, such an initiative would restore the country’s moral high ground in the international community and make it harder for the boycott, divestment and sanctions movement to press its case. The looming question for CIS, of course, is how many voters will be convinced by its argument. Barak understands that the challenge is to get a younger generation, now feeling secure and comfortable, to understand that the status quo cannot last forever and that seeking to maintain it could ultimately destroy Israel’s Jewishness or democracy. A recent study by the Israel Democracy Institute showed that, as has long been the case, the IDF, Israel’s president and its Supreme Court are the most trusted institutions among Jewish citizens of Israel; trust in the army is almost three times as high as that in the government or the Knesset. If CIS can get across its message that an overwhelming majority of former senior security officials support its platform, there might be a chance to sway the electorate toward a more moderate government. Reshef and his partners are optimistic that the public is pliable. After last year’s “scare campaign” with its Arabic billboards, polls found that within a week, some 8 percent of those hostile to the two-state idea reported either having changed their minds or having second thoughts. 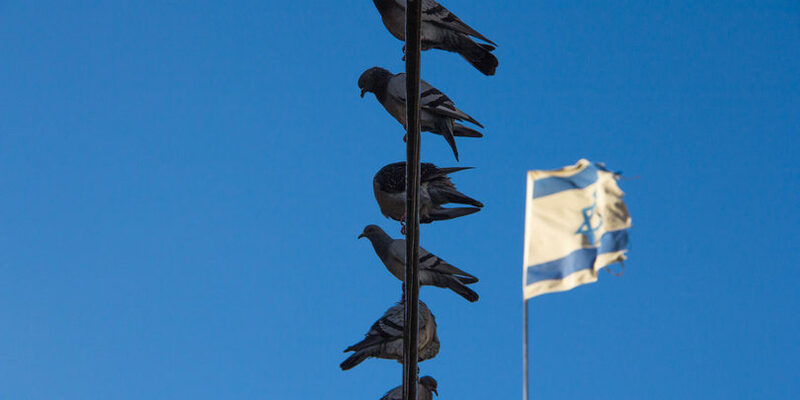 Many, of course, will change their minds once again; the poll merely bolsters their view that Israeli skeptics can be swayed when they are presented with serious arguments about Israel’s future. Indeed, this year’s Nov. 4 Rabin Memorial Rally, coordinated for the first time by CIS, attracted some 85,000 people, twice the average of the preceding decade. Will CIS, along with Israel’s center and left-of-center parties, succeed in shifting the country’s direction? It is far too early to tell. But claims that “liberal Zionism is dead” or that Israel will inevitably doom the two-state solution radically oversimply what is a complex society in an exceedingly complex region.